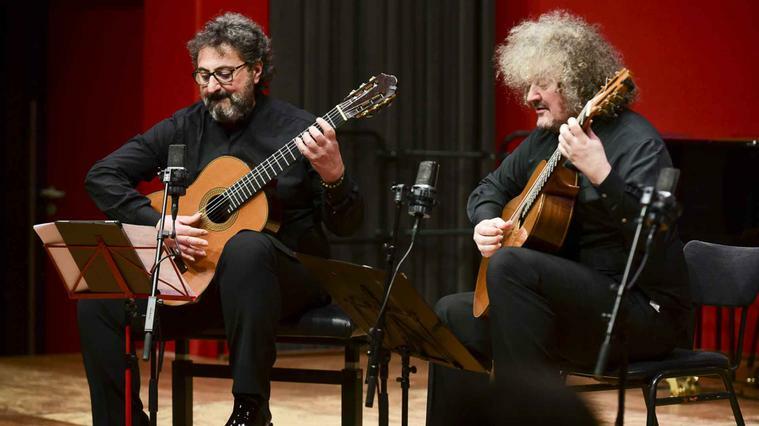 Two of today's most admired guitar masters take to the stage of the Palau de la Música Catalana in an unprecedented concert worldwide, a unique evening for lovers of the Spanish guitar. Zoran Dukic and Aniello Desiderio bring the complicity of decades of friendship to Barcelona, ​​in a unique recital at one of the most beautiful concert halls around the world. The performances of the Croatian Zoran Dukic has been widely praised by both audience and critics. During the last decades, he has performed across the five continents and has been awarded in important events, such as the Guerrero Guitar Competition, sponsored by the Spanish Royal Family, where he was the first foreigner to receive the Best Spanish Music Performance Award. Aniello Desiderio, also known as "Il Fenomeno", he is undoubtedly one of the great guitar masters of today, capable of captivating audiences with his charisma, enthusiasm and passion. Desiderio has received various awards recognizing his virtuosity and unique presence on the stages. His performances have been praised by music personalities such as Chick Corea, John McLaughlin and Lorin Maazel.